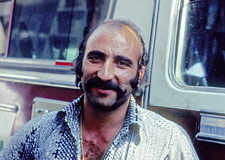 The "pirate" ran his bus tyrannically, eventually getting us from Istanbul to Tehran. The bus was our home for three long days. Every time I got up to stretch, "the pirate" saw me in his rear view mirror and shouted, "Mister, sit down." As soon as the back-up driver took the wheel, we drifted off the road. Sparks, smoke, screaming...no injuries and a ten hour delay. 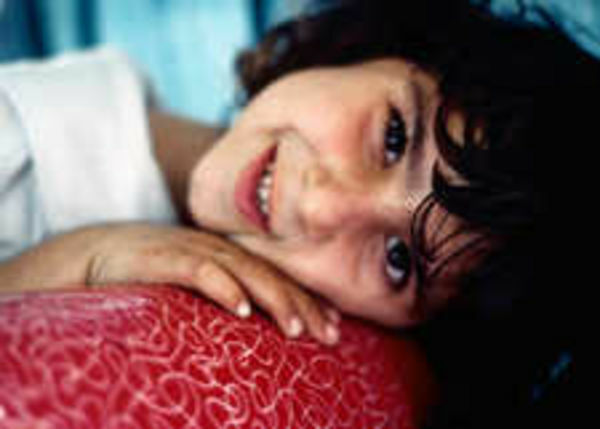 Long bus rides go faster with cute little kids mesmerized by my foreign-ness. Pictures of Iran's Shah were about to come down as Iran readied for a religious revolution and America's strong man was growing weak. 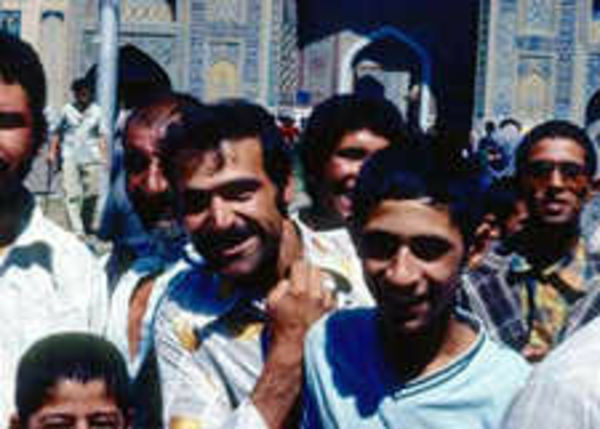 It was 1978, just before the rise of Khomenei, the war in Afghanistan, and the publication of the first edition of Europe Through the Back Door. 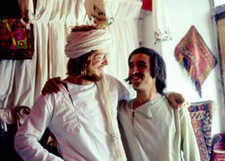 My vagabuddy and future co-author Gene Openshaw and I were about to embark on our first overland journey from Turkey to Kashmir. Walking past Istanbul's legendary Pudding Shop (the traditional hippie springboard for treks along the "freak road" to India), we were heading for a Turkish bath. Like a man appreciates a shave and a trip to the toilet before going to the gallows, we figured we might as well start off this trip of a lifetime clean. Leaving my moneybelt and all First World advantages in my cubicle, holding a tattered towel around my waist and walking gingerly across slippery marble into the steamy netherland of shadowy Turks under Byzantine domes, I felt gawky. And more naked than naked. After an awkward sit in the sauna, my muscular Turk, who doled out massages like cannery workers gut salmon, said "OK, merhaba.' He put me onto the round marble slab where I was allowed to lay, perspire, look up at cloudy sunrays spraying through little holes in the domed roof, and ponder my fate. Gene was laid out next to me, courtesy of his own Turkish sumo wrestler. With a loud slap on my chest the masseuse landed on me, like hands kneading dough in a prison bakery. He smashed and stretched each of my tight muscles. It hurt. But in a strange way I wanted it...just with no lasting damage. He rolled me belly down for the joint stretching. Bouncing my feet to my back, walking on me, noisily cracking my neck, he was a credit to his trade. Lying naked on our bellies, ears pressed to the marble Gene and I grimaced and groaned in each other's face wishing we spoke Turkish and reassuring each other that, of course, our masseuses must know the breaking point. Like lobotomized gumbies, we were led to marble thrones to be doused in hot water and scrubbed with Brillo-pad mittens. Dirt sloughed off us in tootsie rolls. Clean and optimistic, we went to the Otogar (bus station) to begin our 63-hour bus ride to Tehran — the first leg of our journey. Smug as two worldly 24 year olds could be, with seat reservations 16 and 17 in hand, we marveled at the uncivilized riot for bus seats. Tossing our rucksacks to the man on the bus rooftop, we boarded. It became clear — to our horror — that seat reservations had no meaning here. 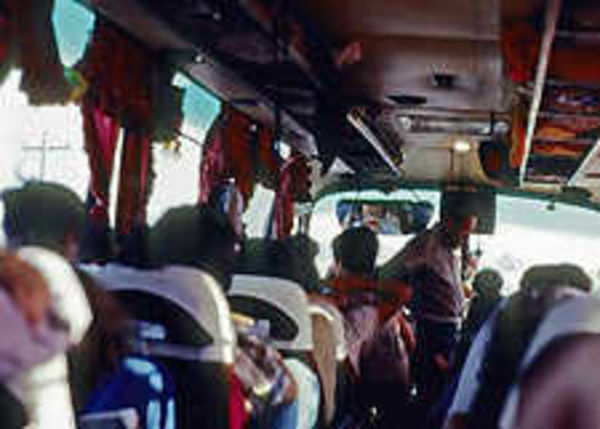 Two seats remained: after-thought jump-seats hanging over the rear stairwell, the only ones on the bus that didn't recline back. In fact, at each stop, they reclined forward so people could get out. Bouncing bolt upright out of Istanbul we took stock of our situation. Sitting atop a rear wheel, we had maximum noise and bounce with minimum leg room. The smelly engine behind us rumbled and doubled as a blast furnace. Surrounded by chain smokers and next to the only window that didn't open, cigarette ashes blew straight into my face. The cover of the aisle light crashed to the floor just as we crossed the bridge over the Bosphorus. Welcome to Asia. We had two drivers. 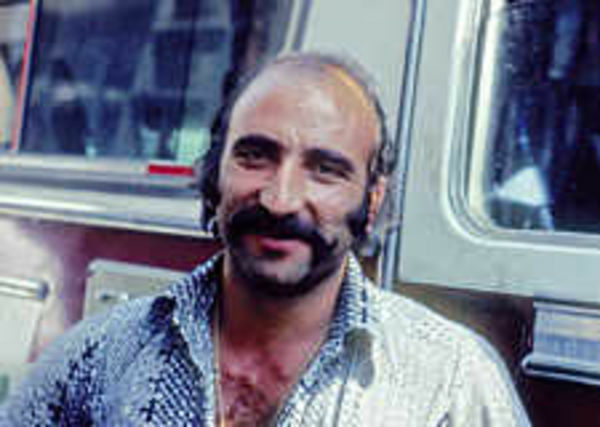 The Iranian commander-in-chief looked like a crazed Barbary pirate, complete with exposed hairy chest, bandanna, and huge scar that seemed to tie his handlebar moustache to his ear. The back-up driver was also Iranian, a half-witted fellow with grotesque pockmarks disfiguring an already hard-to-look-at face. Celebrating two hours into our journey, I got up to stretch my legs. The pirate eye-balled me in his mirror and shouted "mister sit down." Sixty-one hours to go. Well into the night, Gene and I decided to crack open the "bon voyage" bottle of Bulgarian vodka our friends in Sofia had given us a few days before. Made bolder by a tall whisky the Iranians across the aisle gave us, we eventually finished the vodka. I slept like a baby in a cruel papoose. Later that night, ripped out of a deep sleep by the Pirate's hysterical screams, I snapped awake just as our bus was grinding over a curb and crashing to a noisy stop. Smoke billowed everywhere. I thought we were on fire and my still woozy head played out a worst case scenario. Pistachios, empty bottles and bundles of luggage went flying everywhere, but the human baggage stayed put. There were no injuries. Miraculously, my vodka bottle didn't break. Just moments before, the half-wit had slid behind the wheel. He couldn't have been driving for more than a minute when he lost control and crashed through the median curb. A cold wind blew fiercely as we filed out into the night to inspect the damage. The pirate was screaming at the half-wit. 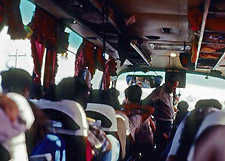 Man muttered around the oil-spattered rear end of the bus...discussing ways to solve our problem but doing nothing. Small boys with toothy grins appeared out of the nowhere with tea and bread rings. And I found a chunk of ground clean enough to continue my night's sleep on. meet Garfunkel, and I, with a Maynard G. Krebs beard and my "I'm not a tourist, I live here" T-shirt, were the only Americans on board. Even with Gene's freshly-pressed degree in religious studies from Stanford and my strong-willed wanderlust, we felt pretty green compared to our (mostly third) worldly bus mates. Brits, Spaniards, Belgians, a Russian, an Iranian student, some Muslim women with children and a few others rounded out the gang. After a ten hour stop, the bus was bolted back together, pushed off the median, and we continued our eastbound journey. Checking our progress, Gene and I stretched our Turkey-to-India overland map from the window over two seats to the aisle...and felt disheartened. During the third night of our trip, the driver stopped and found us hotels (change "t" to "v"). We were somewhere in eastern Turkey. My bed sheet was a police line-up of hairs and body odors. When I complained about my dirty sheet to the hotel man he came up, apologized, and turned it over. Many of our busmates were downstairs in the bar. We didn't go in...loose stools. We set our alarm for 7 am but before dawn we were awakened by the Pirate. Oops. Departure time was 5 a.m. He scolded us in Iranian all the way back to bus and virtually hurled me up the stairs by my hair. I managed a cheery "good morning" to my fellow passengers who had been waiting for nearly an hour. As the road got worse, tea stops became longer and more frequent. It was clear that the Pirate was going to take his time. By mid-afternoon we stopped by a riverside. Our scar-faced leader stripped to his underpants and, with soap in hand, we went for a bath and swim. Like a wild kid he rolled in the sand and splashed back into the river. Then he urged everyone in, insisting, "No bath, no Tehran." We were slow to catch on but soon all the men were floating down the refreshing river in their underwear. I washed myself and my dusty clothes. Long after we had drip-dried, the Pirate was still frolicking in the river. As he finally got back to the bus I scored a point with the driver by offering him a piece of my honeydew melon. He said "Thank you very much. OK! ah-LAH! Hurry up!" and we were off. As we neared Iran our Pirate seemed to feel the gravity of his homeland. He ran a tighter ship and we made good time. The border crossing was uneventful. By 10 pm we were barreling into Tabriz, just in time to witness the armored riot squads bracing themselves for another bout of student trouble. 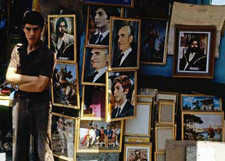 The Shah's portraits hung brittle on walls everywhere. He was about to fall. Eager for this ride to be over, everyone cheered when we learned we wouldn't be sleeping in Tabriz. We stopped there only to replace our half-wit with a capable second driver who could drive us through the night to Tehran. Spirits picked up. This journey would be over in the morning. 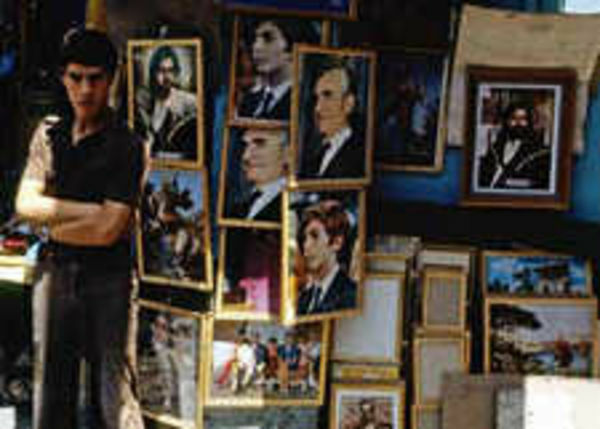 The Spaniards sang and clapped La Bamba, the Russian did opera while the smiley Iranian kid directed with a cigarette. The Pirate washed his feet, spayed everyone with cologne, made up his bed behind the rear row of seats, barked out orders for silence, and slept like an angel. Our long bus ride ended at dawn. After four nights and three days we had traveled from Istanbul to Tehran...about a third of the way to the end of our rainbow, the Vale of Kashmir. Iranians clowned around with Americans. 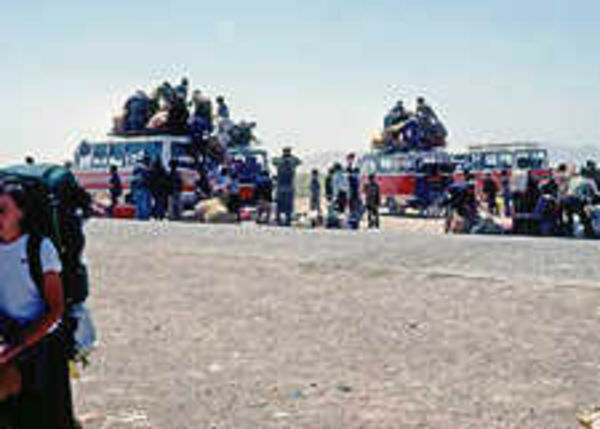 At the Iran/Afghanistan border travelers are organized into mini-bus rides into Afghanistan. Britain is not the only place for double-decker buses. Hop on...there's plenty of room. The bus stops for a break and we're just in time to witness the slaughter of a goat. No time to stay for dinner. We hit Tehran during a major Muslim holiday and all transportation to the holy town of Meshad (the town just before Afghanistan) was booked for several days. We bivouacked in Amir Kabir, the vagabond hotel district, where travelers stranded along the freak road to India kill time. Hidden behind piles of tires and used auto parts lurked countless dirt-cheap no-name hotels. Rooms were decorated in the local style: smashed bugs, broken windows, cigarette butts stuck in sooty holes in the walls, and bare dangling 20 watt light bulbs. We had joined a community of India-bound travelers, living in their rooms like animals in caves, running around in sweaty underpants and bare feet. There we sat, exhausted, methodically pinching bugs as they waded through the hair on our legs. To survive the sweltering night, we made endless round-trips with our bed sheets into the shower. My spirits sagged as I pondered the easy life we'd left behind in Greece. I started to struggle with the wisdom of this trip. I would never be satisfied until I had traveled overland to India. But I didn't want to endure several weeks of hell only to spend a fortune to fly back to Europe. Still hot under my dry-again sheet but protected from the bugs, I fell asleep thinking it was not too late to return to Europe. In three days, maybe five, it could be baklava in the Greek Island sun. But we pushed on. Meshad was a Muslim carnival. Our first taste of Afghanistan was the Meshad bus station. It seemed a jumping-off place for lands beyond this planet. Things seemed more Mongolian than Iranian. The station was strewn with humble bundles and people who seemed more in need of a camel than a bus. Gene was dealing with a little Tehran Tummy. We boarded our Afghan bus pensive and weak. With gritty hairdryer wind blowing in my face, I dreamed out my window. At the same time I hoped the kilometers would tick by quickly, I regretted plunging farther and farther away from Europe. But with so much parched earth behind us, we had no choice but to think of India as Gene and I sang a shaky verse of "Homeward Bound." We were about a week beyond Istanbul and only half way to India. At 10 am we actually hit the "middle of nowhere," a huddle of concrete block buildings which marked the Iran-Afghanistan border. Surrendering our passports we were taken into a waiting room. An interesting mini-museum greeted us with a stern message. Several glass cases displayed the sobering stories of fifteen or twenty ill-fated drug smuggling tourists. It made for interesting reading — who smuggled what, where they tried to hide it, and how much more time they'd spend rotting in a prison. One of our guidebooks actually had a fine print appendix listing assorted First World prisoners who needed blankets, medicine, and so on. I had this clammy fear that someone would plant some dope in my rucksack. After zipping through Iranian customs we walked across a windy desert no-man's-land to a tiny settlement bordered by stripped, abandoned VW vans where local people piled into and onto small orange busses. The wind and heat were fierce, and the barren plain stretched out in every direction. Gene commented, "So this is Afghanistan." In the shade of a wrecked, rusted Microbus we peeled an apple and waited for the bank and doctor's office to open. The next few hours tried my patience as we bounced from one dusty office to the next, jumping through hoop after hoop of Afghanistan bureaucracy. It seems that Gene was missing a vaccination. No problem, they were delighted to inject him right there. It was tough to watch the needle bend as the nurse forced its well-used tip into Gene's flesh. Finally we squirted out into the vast Afghan wasteland. We piled into waiting mini-buses. 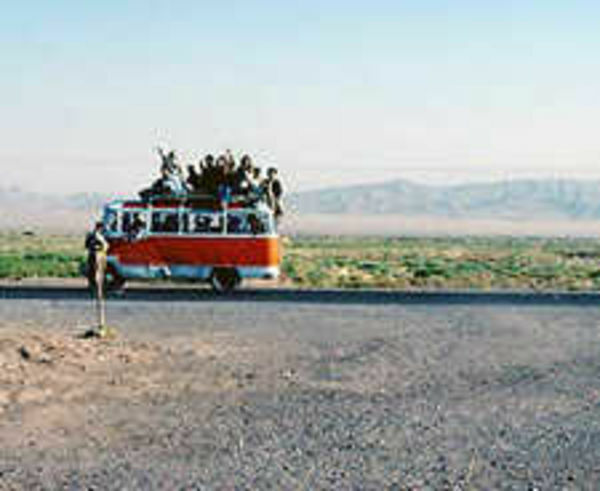 It was the only way to get to the only place you could reach from here — Herat, the first town in Afghanistan. The empty, well-paved road shot like an arrow past random clusters of mud huts, a few "melted sand castle" ruins, seemingly lost herds of sheep and goats, and into the parched, pristine mountain backdrop. Just when I thought this was going smoothly, a commotion broke out in the front of the bus. The Afghan driver decided to double the price of the ride. We road-to-India travelers were a principled bunch and refused. One leathery Afghan pulled out a knife that could filet a goat, and the driver turned around and headed back for the Iranian border. In an uproar, everyone tried to solve the problem. 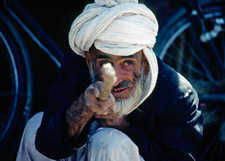 One polite but loud Pakistani urged us to pay, but we figured if we did that they would just extort us again. Compromising, we agreed to pay 50% extra upon arrival in Herat, and the driver turned back toward Herat. We stopped at a desolate tea shop. 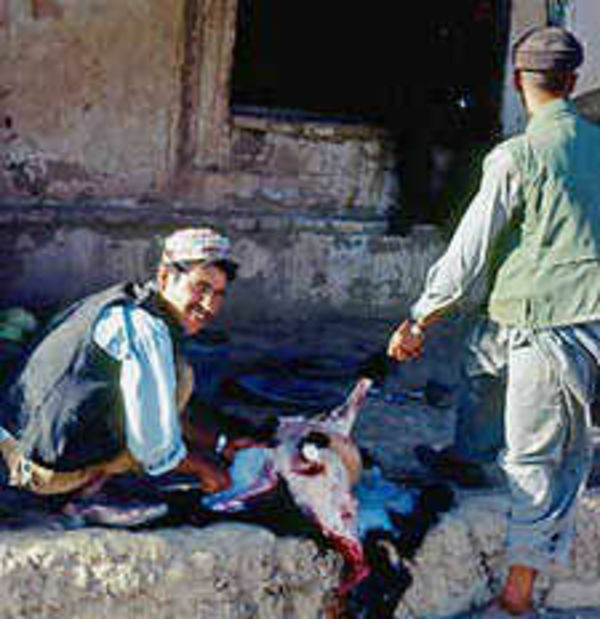 Next to a well, a bunch of locals were skinning a still-warm goat. There was a sign that read "Hotel" and I expected the worst. But this was just an innocent mid-day tea stop which provided Gene and me with our first good look at Afghan life. We cooled down under well-buckets of brown water before sharing a melon. Feeling a bit road-weary, we promised each other that from now on we'd eat well and sleep in good hotels to stay healthy and keep our spirits high. The tea house was classic Afghanistan...old rag-wrapped men, who looked like they worked hard all their lives sat around on rugs drinking tea and smoking hashish. The room was filled with smoke. Their glassy dark eyes smiled at nobody in particular. I stood silently over my melon rinds looking in the window like I was watching a documentary on TV. The word spread...our driver was high as a kite. No one was surprised. 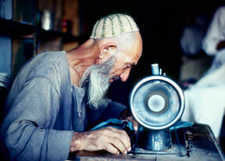 Herat, the first city in Afghanistan after crossing the Iran border, is a thriving montage of artisan shops where chains are hand made and old men bend all day long over Singer sewing machines. Stop by a tailor and you very well may walk out with a made-to-order local outfit. On the bus young girls and their veiled mothers stare at the stray and other-wordly-looking tourists. 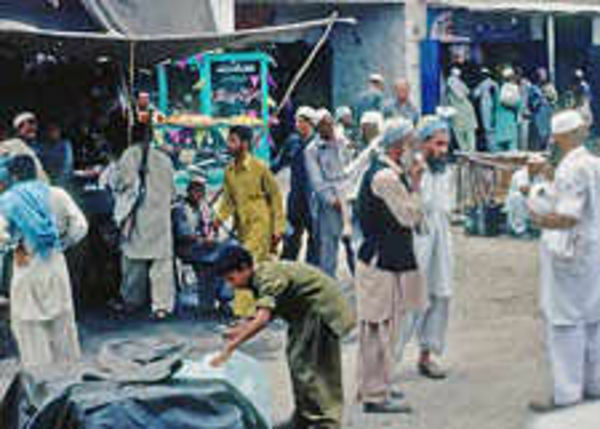 Peshawar, the first city past the Khyber Pass, is a thriving market town where people with rifles slung over their shoulders collect fees from buses for "safe passage." 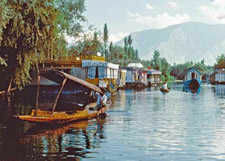 The Hotel Houseboats of Kashmir — the promised paradise on a budget. 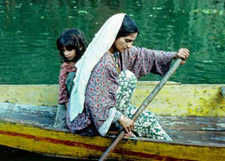 From a Kashmir houseboat, plush and exotic glimpses of local life glide by. Back on the hot bus to Herat, it dawned on us "Yes, this is completely different — and it's starting to look good." I punched Gene playfully on the shoulder and said, "OK, now our trip begins!" As our guidebook predicted, Herat was hard not to like. We checked into the best hotel in town-the place where the locals celebrate their weddings. The hotel menu featured marked-down prices and a note: "Since the People's Revolution, all prices are lowered by 10 afs." Standing on our balcony, hair fluffy, teeth clean, stomachs filled, stools nearly solid, we surveyed Herat. Flower bedecked horse drawn chariots charged through the streets past soldiers and police safeguarding the recent revolution. The elderly cleaning man stood on the next balcony. I told him we needed some toilet paper and he said dreamily, "Yes, it is very beautiful." We stood still, as the sun melted into the purple mountains. Like good girls save themselves, I had proudly never smoked anything illegal in the USA. 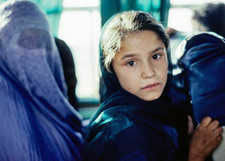 But Afghanistan seemed like the time and place to lose this virginity. Gene had stumbled onto some marijuana and, in the privacy of our room, he stuffed it into a tiny wooden pipe. He took a drag, immediately remarking "Good stuff." I sucked in, not knowing what to expect and hoping not to get a mouthful of ashes. Nothing happened, but it felt fine. I had inhaled. Smoking more, we had dinner and took a walk. Now the kaleidoscope of Afghanistan invited us in. Colors and objects were more tangy. Torch-lit chariots charged through the darkness, men carried lanterns, shopkeepers and their work boys squatted around soup and bread, the wind howled but the night was warm. Mingling was intensified. Local life was suddenly carbonated with little scenes. A man weighed wonderfully back-lit tomatoes. The call to prayer rode its carpet without the harshness. Street urchins still bothered me, but as nieces and nephews rather than money-grubbing strangers. And passing time became, by definition, productive. I don't know if that was because of the marijuana or because I was in a very good mood. I really didn't feel "high." I was swimming in Afghanistan and liking it. s sitting in a brightly but badly painted old bus. I had a panorama window which opened as wide as the countryside. 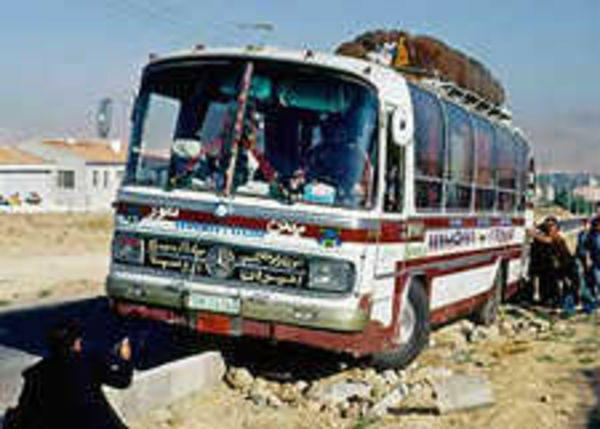 The bus was filled with Pakistanis and western "freak road" travelers. A wide-eyed Pakistani school girl and her mother, face covered by a blue woven veil, sat across from us. For four hours they stared at me as if I was a TV and this was their first look. After an hour-long sit at the border, ignoring persistent black-market merchants pedaling out-dated (and therefore worthless) paper currency and vials of cocaine, we crossed into Pakistan and began our climb up the much-fought-over Khyber Pass. Hanging out the window, I tried to take in everything, every wild turn in the road, every fortress-crowned hill, every stray goat, every gaily-painted truck and every mud hut pimpling the landscape. Dry rocky graveyards with wind-tattered flags littered the hillsides, clouds threatened, and life-worn people crouched atop tiny stone fortresses. If ever the world's most wanted man wanted to hide out...this would be the ideal place. 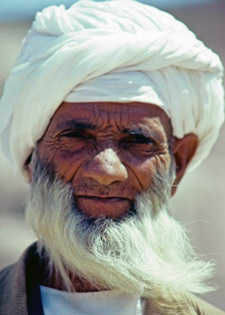 We were moving out of the parched Arab side of South Asia and into the wet Indian sub-continent. From now on we would feel muggy but enjoy a lush countryside. Our bus ticket had a "safe passage supplement" which we all paid. This was collected by a rifle-toting guard positioned just over this semi-autonomous pass. We were in Waziristan — an autonomous district, not governable by Pakistan...notorious for its independent spirit. We pulled into Peshawar — claimed, if not ruled, by Pakistan. The humidity — novel after Turkey, Iran, and Afghanistan — seemed to connect us with the powerful magnet of India. We caught the first train east. Twelve hours of first class for $1.50 extra seemed like a good investment, as we got padded seats and less crowds (which, we were to learn, came with a downside: less flesh to spread around for the bugs). Hot muggy air carried soot from the steam engine through the open window. Bugs came out with the stars. The lights on the train worked like on my old bike; the slower you go the dimmer they glow. It was a dim train. The only thing fast about it was the clouds of bugs that seemed right at home. Like a horse swatting flies in his sleep, I spent the night rolling bugs through my sooty hairs until they disappeared. We awoke energized by the last sprint to the Indian border. There's something weirdly home-like about India, even if you've never been there. We both felt strangely and strongly that we were going home. Words can't explain the joy we felt stepping across that happy tree-lined border. 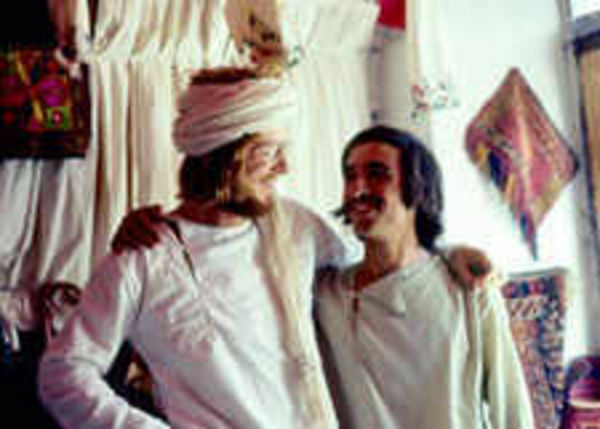 For years, enchanted India had commanded prime time in my travel dreams. Two years in a row, I found excuses to go elsewhere instead. Finally, and thankfully, I had the nerve to make this happen. Strolling past turbaned Sikhs, wallowing water buffalo and lush green fields, I felt great. I had opened a new world and rekindled the travel flame that Europe alone could no longer fuel. But Kashmir, the promised end of our rainbow, was still a two day train bus trek away. 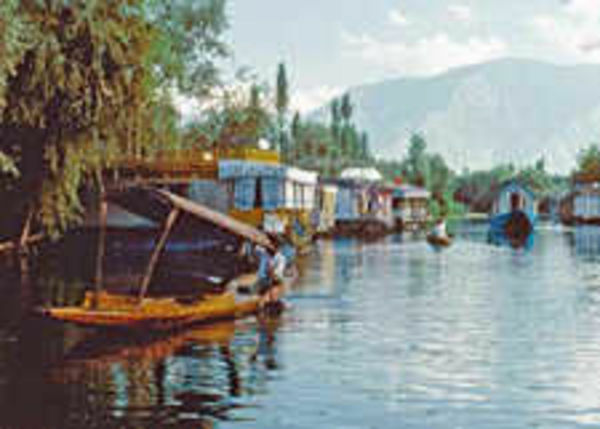 A powerful current pulls travelers north from India's mucky heat to the blissful Vale of Kashmir. The last stretch is 300 kilometers of narrow switch-backs spiced with dreadful cliffs, huge falling boulders, lots of top-heavy trucks and military vehicles, and constant signs reminding divers (as only Indian signs can) to be careful, with cheerful slogans such as "Drive carefully, your family needs you" or "Better late than dead." The terrain became almost tropical as we worked up to a scenic climax. Finally, we went through a long dark one-lane tunnel. When we popped out, we were greeted by a cheery sign announcing "Welcome to Kashmir. You are now in Paradise." The treacherous road became a garden drive through a Mona Lisa landscape. By the time we settled into our decaying Victorian houseboat, we understood what the sign was saying. Climbing to the rooftop, we sank deep into wicker chairs for tea and surveyed our promised land. Below us families sliced silently by in dug-out canoes. The thin air made me feel like breaking my biscuits on the cut glass Himalayan peaks that surrounded us. Sipping Kashmiri tea from chipped but still elegant old cups, Gene and I rested...happily on the cusp of India.